The airport operator is continuing with expansion in hopes of a better year in 2019. Despite looking set to close 2018 with its slowest growth in air passenger traffic in five years, significant investments have been made to boost capacity at Yangon International Airport (YIA) with the airport operator hopeful that traffic will pick up in 2019. 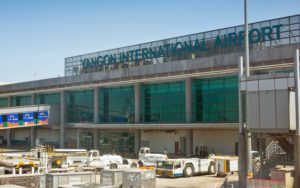 Three years since commencement of operation and management of Yangon city airport, Yangon Aerodrome Company (YACL) has invested in terminals and infrastructure improvements, technical upgrades and staff training to improve safety, security and services. Capacity expansion is currently underway. YACL said 2018 is expected to show an increase of 2.5 per cent in air passenger traffic at YIA, bringing the number to around six million from 5.9 million for the whole of 2017. Over the past five years, air passenger growth at YIA – by far the busiest of Myanmar’s three international airports – had increased at an average of 8.6 per cent annually. YACL said that tourist arrivals from European and North America markets appear to have been impacted by international media reports on domestic Myanmar issues. “While there has been a slowdown in visitor growth, we have continued to expand YIA’s capacity and capability while intensifying efforts to open up new markets. We are confident that, in partnership with all the relevant stakeholders in the tourism industry, the community and the Myanmar government, 2019 tourist air passenger traffic will surpass that of 2018,” said Ho Chee Tong, CEO of YACL.